RJ Barrett leads the Atlantic Coast Conference in scoring. He just recorded Duke's first triple-double in 13 years. 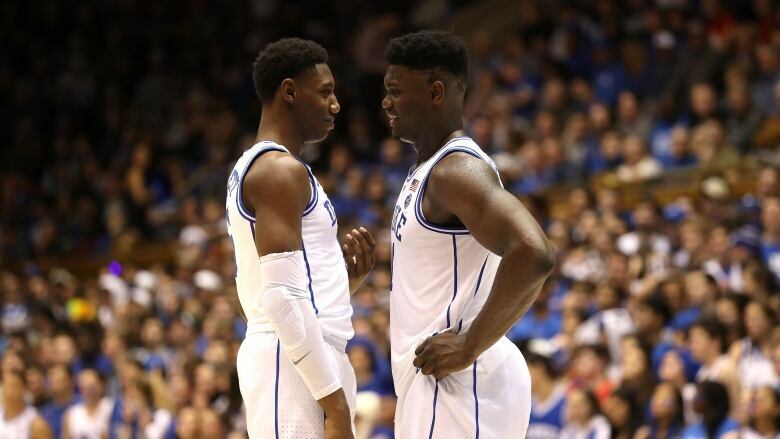 And as long as his roommate Zion Williamson is still around, he won't have top billing for the top-ranked Blue Devils. RJ Barrett leads the Atlantic Coast Conference in scoring. He just recorded Duke's first triple-double in 13 years. And — as long as his roommate Zion Williamson is still around — he won't have top billing for the top-ranked Blue Devils. That's just fine with Barrett. "Him getting attention draws more attention to us, too," Barrett, said Tuesday. While Williamson has been good for a highlight-reel play in virtually every game, the less-flashy Barrett has been consistently productive for first-place Duke (23-2, 11-1) entering its rivalry matchup Wednesday night with No. 8 North Carolina (20-5, 10-2). "We can't just keep our eye on Superman," UNC coach Roy Williams said, referring to Williamson. Barrett and Williamson are clearly the biggest stars on the highest-profile team in the country. Most mock drafts have both being selected early in the NBA draft — should they turn pro after the season. So it's not that Barrett is being ignored or overlooked, but it's more about how dominant Williamson's presence is across the entirety of college basketball. The gregarious, highly quotable Williamson routinely is sought out after games — and he regularly bringing along walk-on Mike Buckmire as his sidekick and teases Barrett for the low grades he often gives Williamson's dunks. In contrast, the low-key Barrett typically prefers to let his play speak for itself. "I think we feed off each other," Barrett said. He played for the Canadian national team and came to Duke a year early after reclassifying, and coach Mike Krzyzewski believes his experiences have helped him handle the attention. "There's a maturity and a comfort level with not taking it seriously, but understanding that if you're going to be good, that's a good part of what you're doing, and not to let it become pressure," Krzyzewski said. On the court, Duke generally knows what it's going to get each game from Barrett because the team's position-less offence frequently runs through him. That means lots of shots — and lots of points. His average of 22.7 points is 0.3 of a point better than Williamson's. He's reached double figures in all 25 games of his college career, has never finished with fewer than 13 points and has scored at least 20 in all but seven games. Yet Barrett also isn't exactly the most efficient player on the roster. He's taken 462 shots this season, and his per-game average of 18.48 is the highest in the ACC and the seventh-highest in Division I. 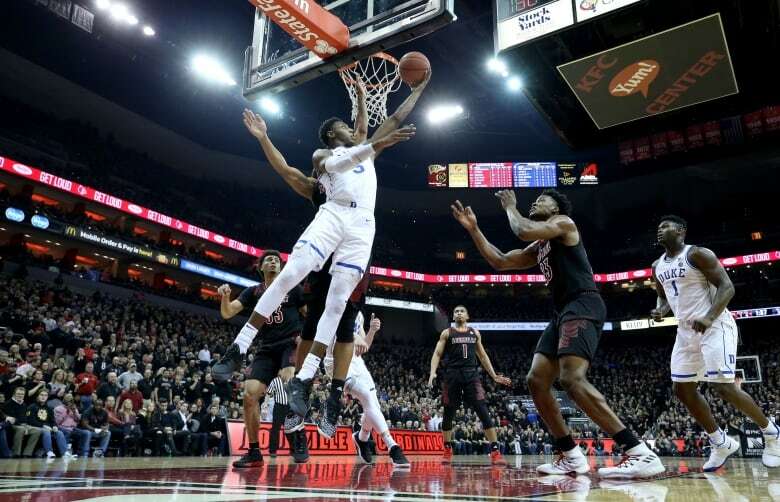 He's put up at least 12 shots in every game, and had 30 attempts in the overtime loss to Syracuse — while also taking over some point guard responsibilities after Tre Jones injured his shoulder early in that game. He has only made more than half his shots in just six games. Barrett is a slasher who is at his best attacking the rim or hitting midrange jumpers — roughly two-thirds of his shots come from inside the arc — but he puts up enough 3-pointers to keep defences honest. A 33 per cent shooter from long range, Barrett hit a season-best 6 of 10 from 3-point range two weeks ago in a road victory over No. 3 Virginia. And yet he's versatile enough to record the school's first triple-double since 2006, finishing with 23 points, 11 rebounds and 10 assists last week against North Carolina State after coming close to one twice before. North Carolina guard Kenny Williams summed the challenges Barrett brings with his own scouting report. "I think you've got to keep him out of the lane," Williams said. "He can shoot the ball. I think he showed that against Virginia, but he does most of his damage in the paint and in the lane, and you've got to keep him, you've just got to do your best to keep him out of the lane and not let him attack you. You can't let him get into a rhythm, because once he gets into a rhythm, he's definitely tough to guard."